Whiteface Mountain has a long standing Adirondack tradition of skiers skinning up the trails for a run before the mountain is open. 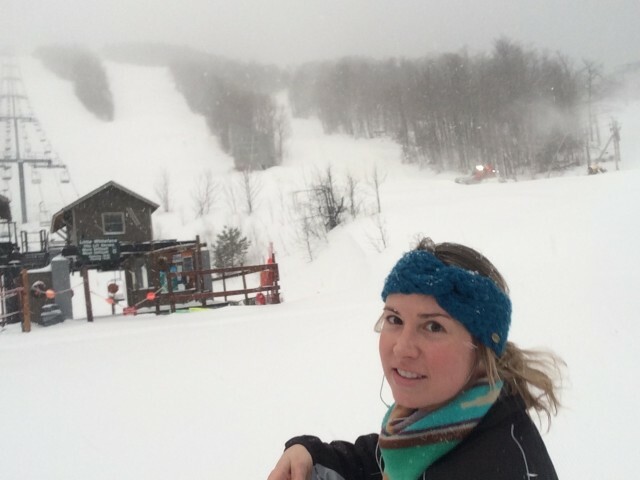 For a couple of years I was the Development Director at NYSEF (New York Ski Educational Foundation) and my office was a beautiful log cabin slope side at Whiteface, in the mornings I would watch skiers arrive early to head up and then ski down the mountain before the lifts began to spin. Some skiers, I swear, I saw almost daily in what seemed to be a morning ritual to exercise and get a run in before heading to work. That always seemed the most appealing to me, what a great way to start your day... exercise, fresh air, and a great excuse to take some turns on untouched snow. I think the reasons for doing this are simple: exercise, practice and training for when the backcountry snow comes in, and sheer bliss of cranking some fresh turns at Whiteface. A friend of mine, Traci had told me how she was planning to do a bunch of backcountry riding this season, and I said I might be interested in giving it a go. So when this blog popped up on my list, I thought this might be the perfect starting point for us. I sent her a message on Facebook (I didn’t have her phone #) and she replied she was interested. Yes! I wasn’t going to have to make the trip up alone. We picked a day and started making plans. We both snowboard, and although I do ski from time to time, I don’t own skins or the right ski binding for skinning up the mountain. We both have boards and snowshoes… I was a bit torn, snowshoe and snowboard or take this opportunity to ski. I did some research. After a few phone calls and surfing online I found that High Peaks Cyclery just down the road from me offers full backcountry rental packages complete with skins! Impressed, I called to ask about availability and store hours and decided to head over after work to try some boots on and get a backcountry set up of my own. There was just one other thing I had to do during work hours, I had to make a trip out to Whiteface Mountain while the offices were open to purchase my uphill ski pass - the mountain offers a season pass for $25. The process was simple, I went to the upstairs office, they pulled up my info and viola printed up a pass. It was as easy as getting my normal season pass. Along with the pass, I was informed of the morning uphill rules. Be visible to the groomers and workers on the mountain by wearing reflective gear and, if necessary, lights. Think front and back because they have the potential to come from both directions. Also have your uphill pass visable. You need to head down before the lifts open. Skinning up is only allowed when the lifts are closed. Stay clear (and far away) from the snow cat cable. For those who aren’t aware, and this is probably the biggest issue, the steeper trails require the grooming machines to connect to the top of the trail with a cable and winch in order to groom it. These cables are known to break on occasion and will seriously injure (and kill) anyone in its path. So just stay out of the way and you’ll be safe. The cable can be found in the air and even touching the ground, so be sure not to ski under or over the cable. They scare me so I just stay as far away as possible… and would suggest trying not to skin a trail where this is taking place. As with any ski pass you are held responsible for your actions and note that skiing can be dangerous and has its own risks. With pass in hand I headed back to Lake Placid to get fitted for gear. I have to say the staff at High Peaks Cyclery was amazing. They even have a few knowledgable guys who lived for that lifestyle and had plenty of first hand experience of the morning Whiteface skinning ritual. In fact, a couple of them were planning to go the same morning as Traci and I. I had spoken to Bruce over the phone, so when I got there, I asked for him and he helped me out. He started by asking what I wanted to ski and then tailored the rental package to what would best suit the experience. 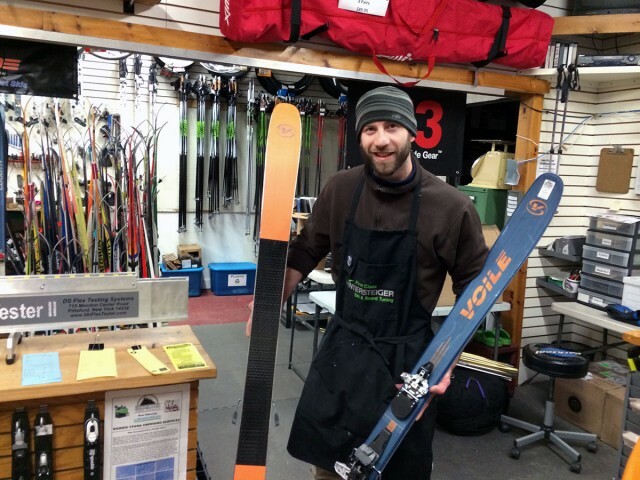 The store has a great selection of skis, bindings, boots, poles and skins to make sure you are outfitted accordingly. He fit me with a setup that would best suit both the grade I would be climbing at Whiteface and the style of skiing I would be doing down the mountain. I don’t telemark, so he set me up with back-country bindings where the heal lifts for the uphill trek and then locks down for the descent. I tried on boots, the first pair was a perfect fit, and oh so comfy for ski boots… and light. Apparently another perk of backcountry skiing. I’ll take it! He then fit my binding to the boots and my skis were pretty much ready to go. He showed me how to set them up for the climb up with the variable heel lift settings to match the terrain along the way. I then learned how to lock the heel down once I reached the top. Then he got out the skins and gave me a refresher course on how to use them. If you haven’t ever seen skins before, they are quiet genius, they feel like a thick fur, smooth when you run your hand down it and prickly/sticky when you run your hand up. Bruce showed me how to put the skins on, along with how to take them off and pack them away. It definitely takes a bit of practice and finesse, but he is definitely a pro, and luckily for me I will only be making one trip up and one trip down, so he put the skins on and my only job will be to take them off at the top and put them safely away in my pack. 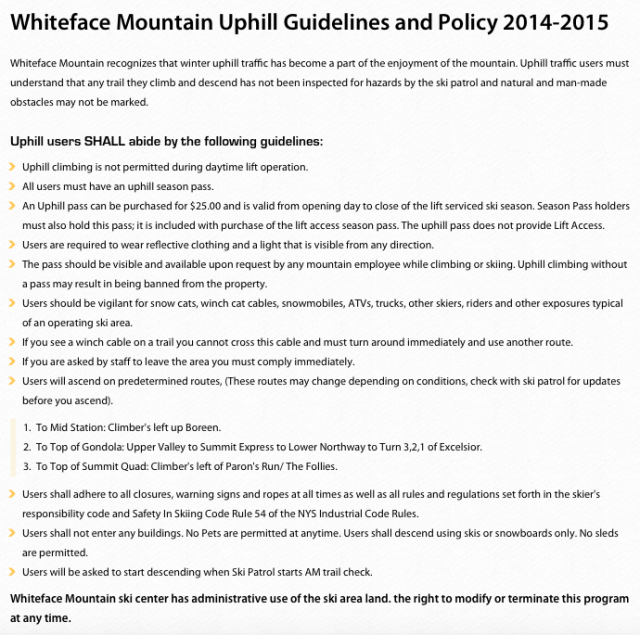 What to know about skinning up Whiteface? I asked the guys a variety of questions as to how long it takes to skin Whiteface, how far people usually go, what trails to take and anything else to expect. Dress in layers (you will get hot) and in appropriate gear. Think ski socks, under-layers that wick sweat, a water proof / wind proof layer. The mountain can get windy and even if it’s not snowing, chances are you could run into snow guns. Plan on 2 hours depending on what you want to do, the guys said that is a good amount of time to get to the top of Little Whiteface… However, if you are planning to try for the summit you should allow more time. Bring a headlamp and make sure you’re visible to the snowcats/groomers/snowmobiles/etc. Bringing water is also a good idea. The staff is happy to map out the course up the mountain and suggestions for coming down based on your ability and interests. The guys said they usually get to the mountain at 6am. Not being much of a morning person and it being our first outing Traci and I decided to leave Lake Placid at 6, in hopes of being geared up and ready to start skinning at 6:30am. I head home to pick out what I’m going to wear for the next day and get it all laid out and ready to go. I text back and forth with Traci during the process as we decide how to layer and remark on our excitement for the adventure awaiting us the next day. I went to bed that night feeling like the kid from the disney commercial, “I’m too excited to sleep.” I kept waking up throughout the night, my mind seemed to think that it might miss the alarm. I awoke at 4am, and again at 4:30, then finally at 5:30 it was time to get out of bed and get going. I geared up, brushed the fresh snow off my car and headed to pick up Traci. So far so good. She was ready and waiting. We loaded up and headed to the mountain. The early morning roads were snow-covered and a bit slick, we drove a bit below the speed limit to be safe. A truck caught up to us as we entered the access road to the mountain and we both turned in. We parked the car and the truck pulled in alongside us. It was another morning skier. Traci and I got out of the car and the guy said hi. I couldn’t see his face because it was so dark but we chatted for a moment. I asked him if he’s done this before and told him we were newbies. I believe he said he makes it out almost weekly. We discussed what route to take up the mountain, and he told us we were probably dressed too warm and might get hot. This relieved me, because I wanted to stay warm until we started the climb and had every intent of packing my little puff coat away in my backpack until we reached the top. You could tell he had done this before and had his routine, before I could even finish getting my boots on he had disappeared with his gear up the trail. We took our skis, board, snowshoes and poles out of the car and did one last survey to see if we were all set… and we were off. Making the short walk from the parking lot to the ski hill - we felt spoiled, being some of the first to arrive for the day. Traci put her board down and strapped on her snowshoes and I stepped into my ski bindings. Slow and steady was the advise we got from everyone, that was great - slow and steady was exactly where Traci and I wanted to start. Traci strapped her board to her backpack and we headed up. About 15 minutes up we were already ready to take our first break, get a drink of water, and take a layer off. I stuffed my jacket in my backpack and we moved on. Slow and steady. We both had earbuds in, music playing, and we were following the tracks of what we presumed to be our buddy that parked next to us in the truck. Another 20-30 minutes of slow steady pace and midstation is almost in sight. We hear a snowcat approaching behind us so we take another break and stop at the side to make sure we are out of the way, waving as it passes. Now we see a skier passing on his way down. It was before 8am, I wondered how high he hiked; was it the guy from the truck, was he heading down so he’d make it to work on time or was he hoping to get a 2nd run in before the lifts started up… Either way it was fun to see and got us focused on the task at hand. We chatted a bit on the way up and took a few breaks to snap a few photos for the blog… for Christmas my mom gave my brother and I these extendable selfie poles she got on her trip to China. We laughed at it at the time, but I realized it would be fun to take along on blog outings. So here we are testing it out. Smile. We hiked up to Midstation and took another short break. I'm wishing it was open so I could get one of their awesome BECs (bacon, egg and cheese sandwiches) and a hot cup of coffee, since I missed mine this morning. I look up at the Whiteface Mountain cam located over the deck and wonder if anyone is online right now checking it out and watching us. Too bad it’s too early to call anyone to have them take a screen shot of the two of us for this article :) We discuss how we are getting a bit tired for our first climb, plus time is running out, and so we decide to head for the top of the Facelift as our end point. I take another selfie with my handy-dandy selfie pole, there’s a groomer in the background. We head past the groomer and up Upper Valley to the top of the Facelift. We pass a few snow guns on the way, and I’m glad to have a light outerlayer on that protects me from the snow sticking and melting. Another skier cruises by, I’m excited - our turn is coming soon. A few minutes later we reached the top of our climb. While I’m content with our accomplishment on the hike, I have to admit that I did have hopes of making it to the top of Little Whiteface, even though I knew we didn’t exactly leave early enough to make that with our slow and steady pace. It was almost 8:15am and the lifts were starting to spin. I pulled my puff coat out of my pack, very happy to have that with me to put on, as I was cooling off quickly now that we had stopped climbing. I removed the skins from my skis and placed them in the pack. While Traci strapped on her board, I flipped my bindings and stepped in. Ready to enjoy our little reward for the morning’s work, we headed down. It was gorgeous, there were only a few tracks carved into the fresh snow. The conditions were amazing and the ambience around us was so quiet, still and peaceful. I enjoyed every turn I made down the mountain that morning, trying to take it all in, what a great way to start the day. As we arrived at the base, skiers and riders were making their way to the lifts. Traci and I looked on longingly, we were in total agreement, we could really go for a few more runs. But, work was calling… so perhaps another time. We got back to the car and noticed the truck was still there, maybe our buddy was out taking a few more runs via the lift. Success! We were both happy with a solid first attempt skinning Whiteface. We decided to try to do it again, hopefully on a weekly basis and with the plan to also move onto other backcountry adventures in the Adirondacks. I dropped Traci off and headed in to town to return my gear at High Peaks Cyclery. It was quick and easy dropping everything off, so I stopped by the back of the shop to briefly chat with them about my morning. From what we discussed there were about 10 people who skinned up that morning. Sounds like on any given weekday that’s pretty normal and on most Saturdays 20-30+ could be found heading up. There was a gentleman in the shop the day before looking into buying backcountry gear, he was back in the shop finishing up when I arrived. He was glad he was there to ask me how it went and was excited to get started himself. I told him a bit about my morning and then said goodbye and headed to work. I’m looking forward to more morning ski adventures up Whiteface. There are so many ways to vacation in the Adirondacks, connect with nature, and get in shape while doing so. Check out the great things to do in and around Whiteface and while you're at it, browse some of the close by places to stay - don’t miss the packages page. See you at Whiteface!